Rihanna is definitely not afraid to try new styles or colors. The popstar said in an interview with Harper’s Bazaar that she likes to be rebellious through her music, tattoos, and of course – her hair. She went on to say that her favorite hairdo was her red locks because of its bold and daring look that received a lot of attention. 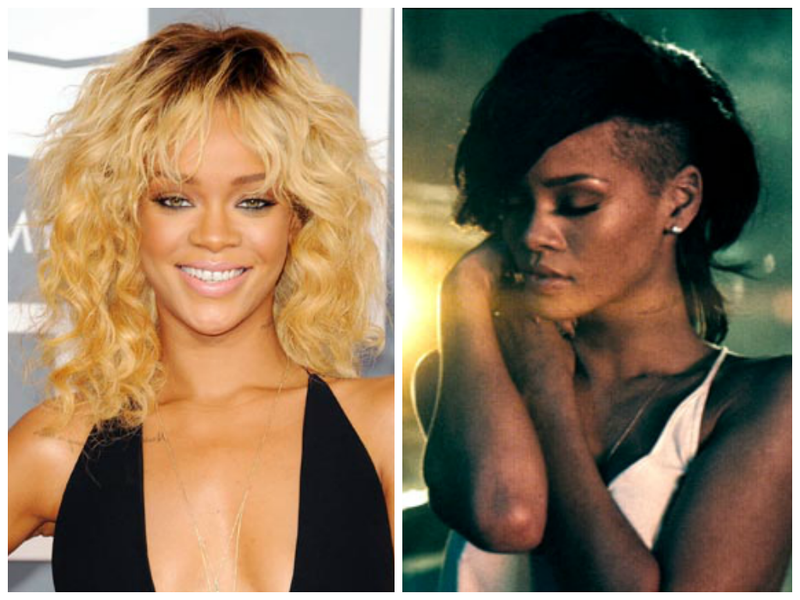 The pop phenomenon never sticks to one hairstyle for long so lets take a look back at Rihanna’s hair evolution. 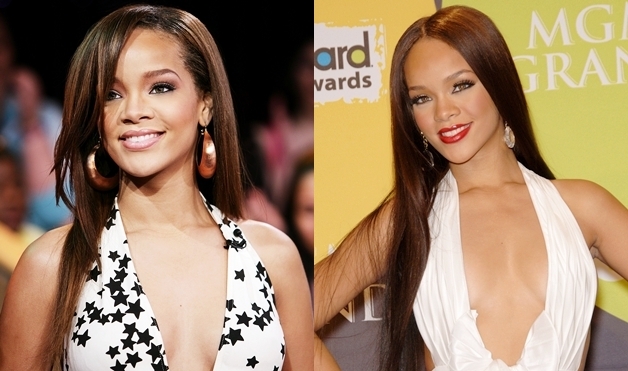 In 2006 Rihanna still had long luscious locks. From an off-center part and side-swept bangs and also a center part and long shiny tresses, she looked ultra fabulous. Rihanna has dabbled with the A-line bob hairstyle a few times but she first debuted this look in 2007 well before it became one of the hottest haircut trends. Rihanna’s 2007 a-line bob at the Nickelodeon kids choice awards. By 2008 Rihanna’s locks had gotten even shorter than her A-line bob and we’re not complaining. She looked stunning with her long pixie hairstyles. Regardless if they were straight and edgy or glam and curled she looked stunning. 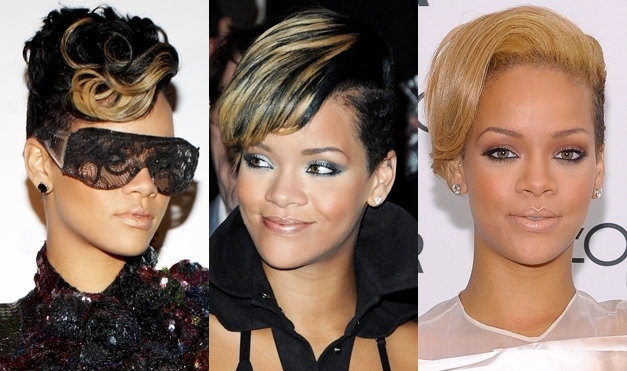 In 2009, Rihanna took her pixie to the next bold level. 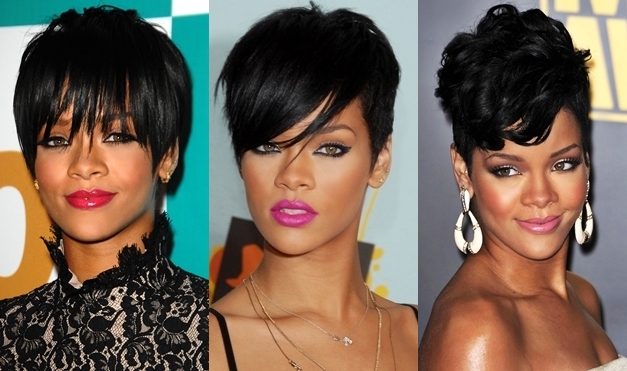 This was when Rihanna’s had sculpted edgy pixie hairstyles that showed off her gorgeous facial features. 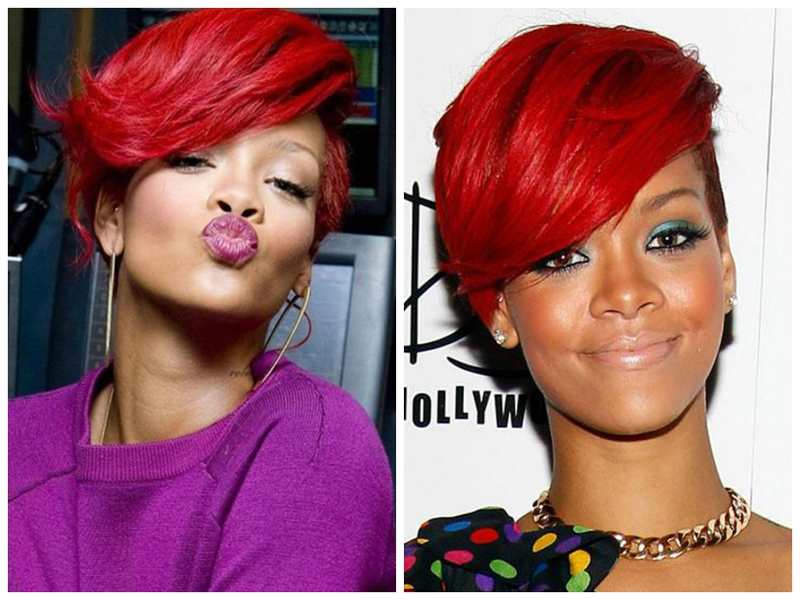 We know RiRi loves red hair and that’s probably because it looks firey hot on her. In 2010 she experimented with her edgy pixie by dying it this vibrant red. 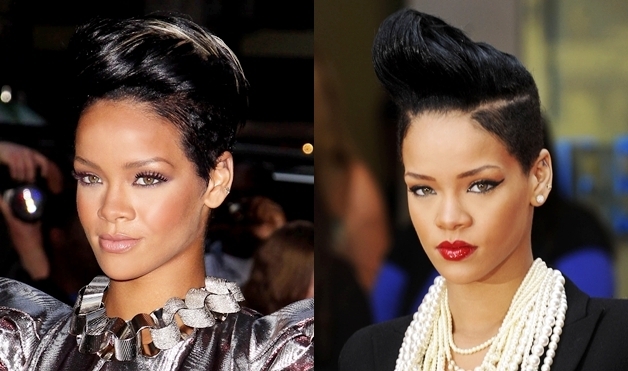 After a few years with a pixie hairdo, in 2011 Rihanna went back to her longer hair but kept the bold looks. She tried all types of textures from this curly afro to long and elegant tresses. Towards the end of the year she went back to a more natural brown color. In 2012 for her music video ‘Diamond’ she showed off one of her edgiest looks with this one-sided bob and shaved sides. She also went bleach blonde at the 2012 Grammy’s. 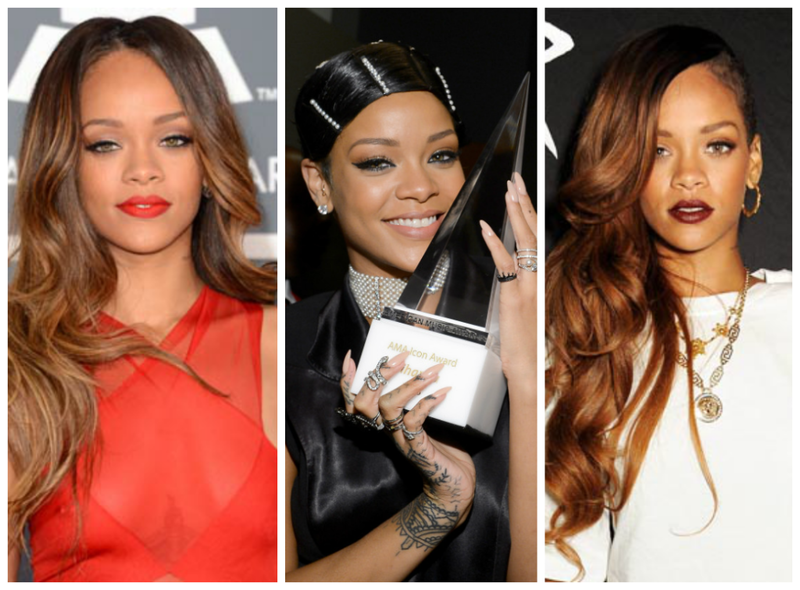 Rihanna’s hair styles in 2012. In 2013 Rihanna debuted long natural looking brown hair at the Grammy’s but for the AMA’s she turned heads when she wore a doobie wrap. She often has long honey brown hair and a shaved side. 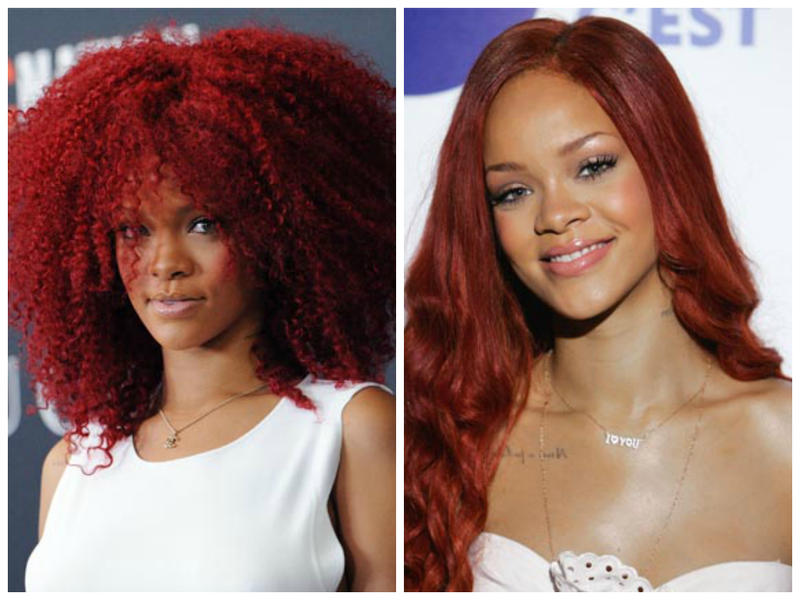 Of course we couldn’t cover all of Rihanna’s hair changes in one hair story. One thing is for sure – Rihanna changes her hair faster than the seasons change. Nobody rocks fierce crops, long locks, and bobs or curls, straight tresses, or glamorous waves like RiRi. We can’t wait to see what she will do next.